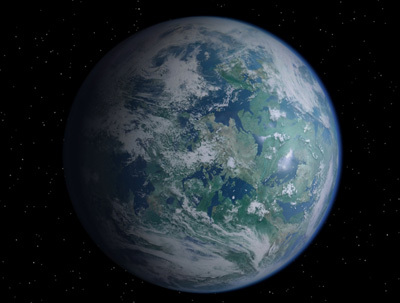 Alderaan is the second planet in the Alderaan system. A revered Core world, Alderaan had long been a center point in galactic politics, exploration, and culture. Alderaanian exploration vessels plied many of most important trade routes in the galaxy. Colonists from Alderaan settled many scattered worlds. Alderaan was a beautiful blue green orb lacking moons, and was the home of a peaceful society. Unlike the crowded Core worlds like Coruscant, Alderaanian society struck a harmonious balance between urban centers and undisturbed wilderness. Alderaan was once home to a native sentient species that had long ago died out, an insectoid culture known as the Killiks, who left behind impressive hive-edifices -- called Castle Lands -- on the Alderaanian grasslands. Much of Alderaan was covered by gently swaying grasslands and prairies. Alderaanian artists used the landscape itself to create living works of art, planting grasses of different hues and textures along carefully plotted paths. The savannahs supported a variety of ruminant life-forms, such as grazers and nerfs, and ranching was a common occupation on rural Alderaan. The few metropolitan areas of the planet were designed in such a way to complement their surroundings. The city of Aldera's skyline consisted of gently curved, gleaming white buildings that formed a subtle bridge between the green grasses and white clouds. Here, students from across the galaxy studied at the famed University of Aldera, a learning institution that promoted freethinking, much to the chagrin of the Empire. Other centers, such as Crevasse City, melded so perfectly with their surroundings as to be almost invisible from a distance. Alderaan was represented in the waning days of the Republic by such venerated politicians as Bail Antilles and Bail Organa. Alderaan was also one of the earliest supporters of the Alliance to Restore the Republic, though its officials prudently kept all ties to the Rebellion covert. During the time of the Empire, Alderaan's representative in the Senate was Princess Leia Organa. Using her political stature and inherent diplomatic immunity, Organa was able to skirt past Imperial blockades on missions of mercy that aided beleaguered Rebel units. Her compassion and the tyranny of the Empire would doom poor Alderaan. Leia was captured intercepting vital Imperial plans, and taken aboard the unspeakably powerful Imperial superweapon, the Death Star battle station. There, Grand Moff Tarkin demanded to know the location of the Rebel hidden fortress. When Leia refused to divulge that information, Tarkin targeted the Death Star's prime weapon on Alderaan. Leia attempted to spare her homeworld a horrible fate by giving Tarkin a false answer. It was no use. Tarkin unleashed the Death Star's power regardless. With a single blast, Alderaan was reduced to rubble, and its population, numbering in the millions, was killed in the blast. The planet had no weapons or military force, but it wasn't always so. During the Clone Wars, violence and warfare almost destroyed Alderaan. As a result, Viceroy and First Chairman Bail Organa outlawed all weapons, and declared a state of peace. This period of regrowth was spectacular, and Alderaan was renowned for its beauty, hailed as the "Bright Center of the Universe." The destruction of Alderaan had a great polarizing effect on the galaxy. Worlds that attempted to remain neutral in the Galactic Civil War soon found themselves taking side -- those terrified by the act of Imperial brutality and hoping to avoid similar reprisals sided with the Empire; those offended by Alderaan's destruction began to openly or covertly support the Alliance. Many residents of Alderaan who were offplanet when their homeworld was destroyed were quick to join the Rebellion, though a few became fanatical supporters of the Empire, blaming Alderaan's involvement with the Rebellion for its destruction. Alderaanian survivors operated the massive ion cannon on Hoth's Echo Base. Survivors who wished to continue a peaceful existence, and not be involved in combat, were transported to New Alderaan, an Alliance safe world. All that remains of Alderaan today is an asteroid field known as the Graveyard. Many Alderaanian survivors return to the area, to pay respects to their deceased loved ones and revisit cherished memories of their dead world.